I generally buy anything I can second hand. Since I spend a lot of time searching for inventory, I get a chance to go to a lot of estate auctions, yard sales and thrift stores to find things I need for myself too. This weekend I happened upon an estate auction where I found more than I expected (or thought would fit in my hatchback). I’d been wanting to trade my old bicycle for a while. The one I had was a bit too small and I wanted one a little bit more functional. I like running errands by bike and wanted something I could put a basket and saddle bags on. 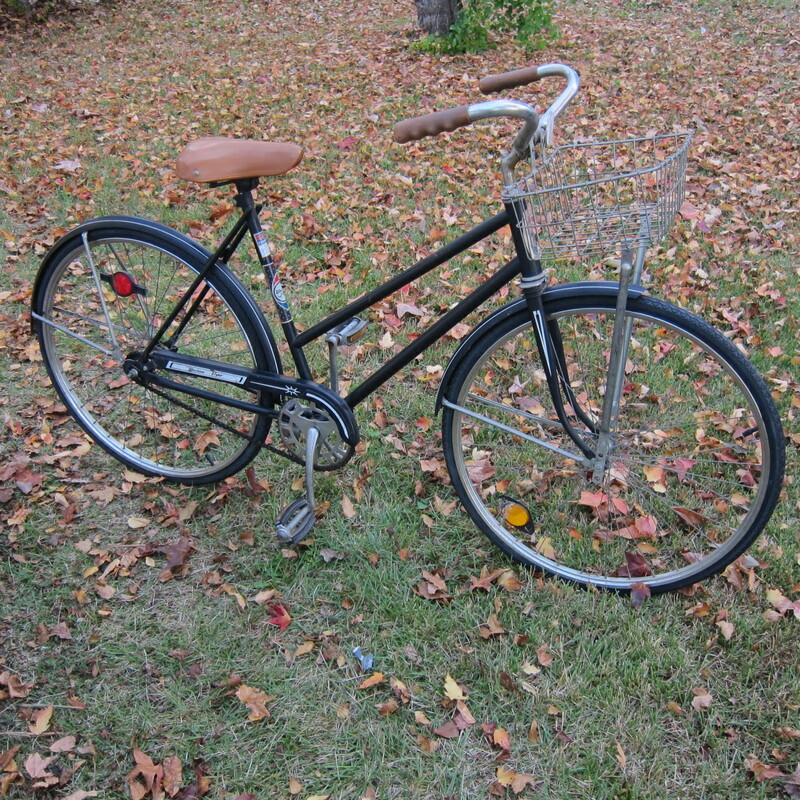 I found this great vintage Western Flyer bike for $30 that is just my size and even matches my style. It’s the first single speed, girl’s bike I’ve had in a long time. I cleaned it up a bit and put new tires on it and now it rides perfectly. I’ll probably be spending the next few weeks getting my legs in shape enough to ride a single speed bike for more than a few blocks before cursing myself. I also came home with a old school sweeper that I can use to sweep up under-the-couch crumbs without electricity, a hot dog maker I probably didn’t need and a set of Yaktrax, which I’ve been wanting for a while since they’re predicting a bad winter here. I paid $1 for each one of these. I also bought a wonderful vintage coffee table that simply spoke to me. The top is solid brass and the legs are collapsible (fitted together with hinges that allow them to fold up flat). 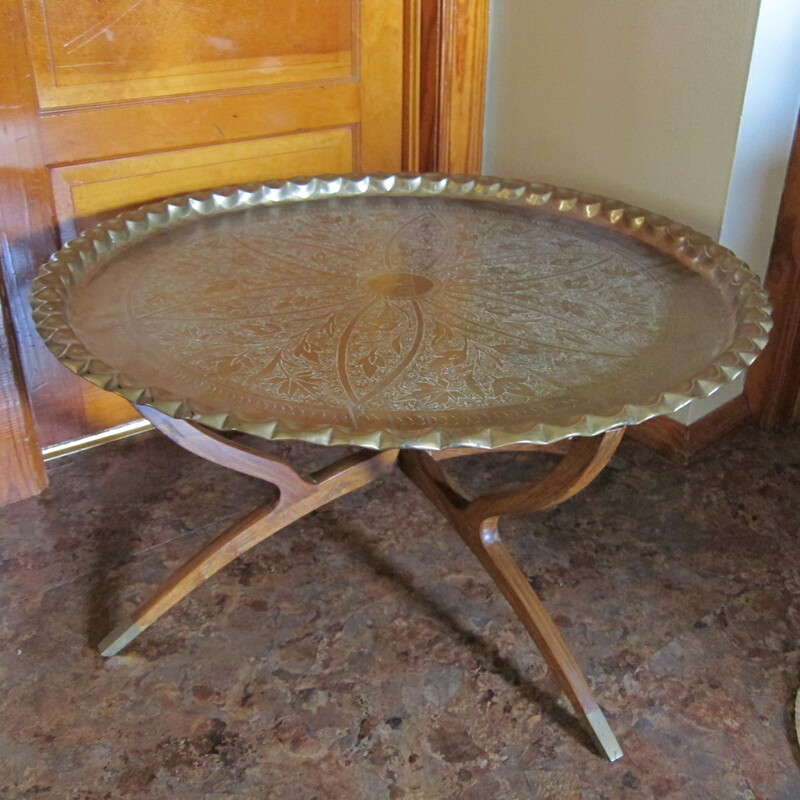 The juxtaposition of the mid century style wooden legs and the opulent decorated brass top was unexpected. It was so unique that I’d never seen anything like it. I did a little research and found out its a Hollywood Regency style piece from sometime around the 50’s. They were very popular in the middle of the century, and people would often hang the brass tops on the wall for decoration. I can see myself making a template of the legs and using them to design something similar when I start building furniture after our next move.